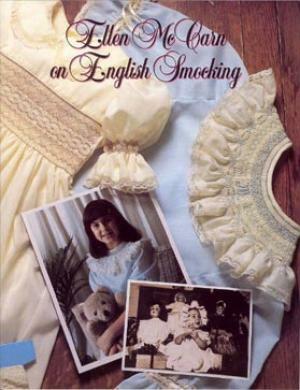 Ellen McCarn on English Smocking, With 32 pages of beautifully illustrated instructions, the color booklet covers beginning through advanced smocking and includes sections on pleating and construction advice. 150 step-by-step illustrations, photographs and 7 designs make this volume a must for both student and accomplished smocker. Enter the World of Ellen McCarn Where Needle Arts Come To Life! "The Needle Arts Collection of Ellen McCarn" has become the standard of excellence for creative needlework. This growing collection consists of 235 published plates and several instruction booklets. All are in full color with easy-to-follow designs, graphs and directions. The line is topped off with a collection of the most popular patterns on the market today, including the Ultimate Bishop and Ultimate Yoke dress patterns. The creative world of Ellen McCarn is one of dedicated service, personal pride and traditional value. It can easily be yours! So bring your needle art to life. Enjoy your visit, and come back often!